The arrival of autumn for the History Museum means turning off its lights, boarding up windows, and bunkering down for the long and cold winter season. But just because the museum is not open does not mean work and research halts. This past week our curiosity overtook and we began browsing through old archives and artifacts. We stumbled upon a photo negative with eighteen young men wearing suit and ties sitting atop steps. 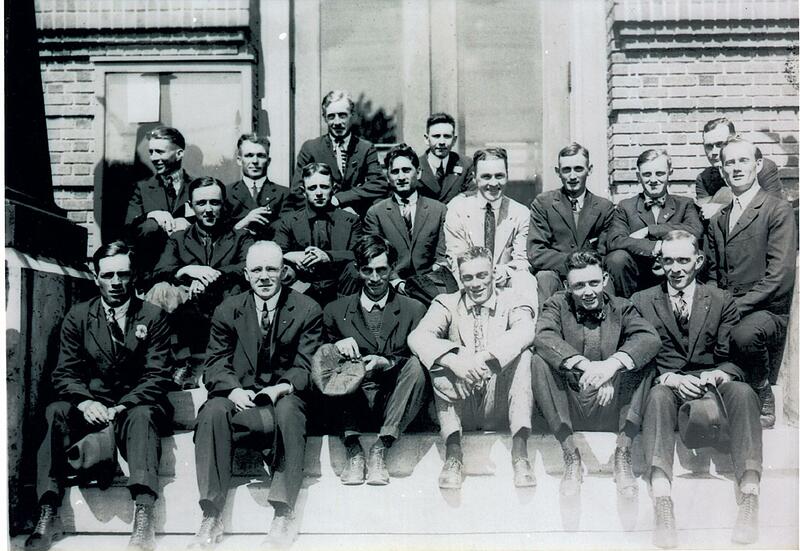 In pencil is scribed: “Drafted Group on Town Hall steps, original photo taken May 27, 1918.” The image is of local men drafted for World War I, sitting on top of the North Elba Town Hall steps. The United States entered WWI in April 1917. The same year, the Selective Service Act of 1917 authorized the United States federal government to raise a national army for service in World War I through a draft. The Act was canceled with the end of the war on November 11, 1918, and was upheld as constitutional by the United States Supreme Court in 1918. Coincidentally, November 11, 2018 signifies the centennial anniversary of the end of World War I (1914-1918). The only other information written on the photo’s envelope is “E2 4 LITS.” If you have any other information on the identity of these men, please contact the Historical Society at info@lakeplacidhistory.com or call 518-523-3830.